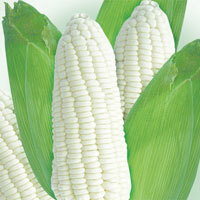 Glutinous soft pearl-white kernels, very tender (excellent eating quality). Good for mulching and open field growing. – Medium maturity of 90 days after sowing (60 days in tropical areas) / FAO maturity Index : 360. 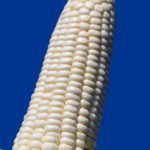 – Ear length : 18 – 20 cm, ear diameter : 3.8 – 4 cm , ear weight : 300 gram on average, – 14 rows of kernels per ear. Excellent tip fill and very good husk cover. 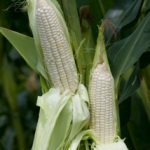 Good shelf life and high production of uniform cobs. – Plants are about 1.8-2 m high. – Number of fertile ears per plant : 1 This variety has a wide adaptability to different growing conditions. It develops a strong root system and has good tolerance to lodging and rust. SKU: CORN005. 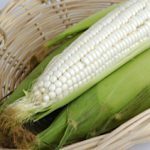 Category: Corn & Sweet Corn.